Five Amazing Diabetic Blogs to Follow! If you or anyone you know is a Diabetic including both Type 1 and Type 2, then it’s a smart idea to keep in the know of any news relating to this condition affecting millions of lives worldwide. To give everyone some help, we’ve put together a short, yet an insightful list of five amazing diabetic blogs to follow for education, for positivity, and for fun! To begin, at the top of our diabetic blogs list is DiabetesMine. We love this blog. It’s truly been a valuable resource for us at StickyJ Medical ID and for many readers around the world for providing life-saving education and understanding on all things related to Diabetes. It’s a powerful blog with many tips and educational information to keep its readers up to date with new scientific findings and positive results related to diabetic conditions. We suggest visiting their blog anytime you have a diabetic-related question. 2. The second blog which is well deserving of much attention is Scott’s Diabetes. In his versatile first-hand experience blog, he provides the public with the knowledge he’s gained about Diabetes from various conferences he’s attended and he helps to keep people in the know of upcoming advances to treating and possibly one day curing this condition. 3. The 3rd blog you should consider following is TYPEONEDERFUL – such an awesome, catchy name, right? They specialize in providing amazing products for people with Diabetes – mainly awesome, trendy teeshirts, that everyone, especially the millennial population will want to wear! You can enter your email for their journal updates and we suggest browsing their shop for truly great teeshirt choices which help to bring awareness to Diabetes in a unique, exciting and powerful way. 4. 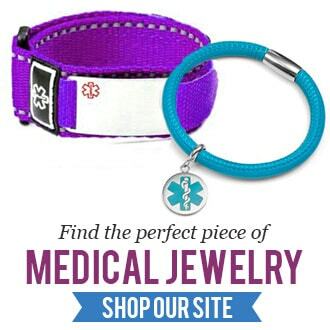 Next up, we’d like to mention our own blog – StickyJ Medical blog which sprinkles in articles related to Diabetes regularly to keep our readers informed of important subjects and safety information such as our diabetic products including diabetic bracelets and necklaces which help to assist in the lives of many of our customers daily. Visit our blog and select the Diabetes category to find all of our insightful articles. 5. Last, but most certainly not least, for all of the glamour-loving sparkle friendly people out there, we suggest following Glitter Glucose! The vibrant writer of this colorful blog helps to make diabetes shine! Who says Diabetes has to be ugly?! With her signature catchphrase – “Gimme Some Sugar” she takes Diabetes from being a serious, droll and depressing disease to being a part of your life you’ll simply smile about. Visit her blog today for great Diabetic product reviews and follow her on Instagram by searching glitter glucose for her sparkle-filled diabetes-focused image posts! There you have it; follow any of the above-mentioned blogs in this article and you’ll find all the Diabetes resources your need!